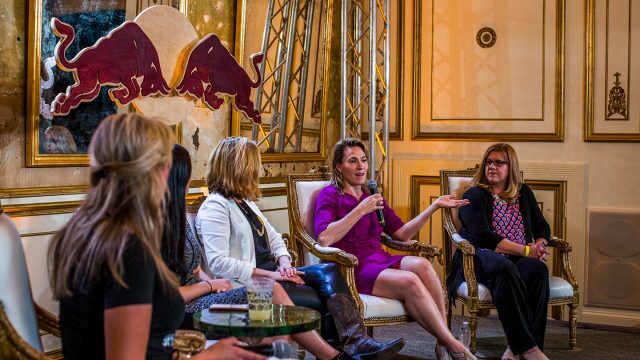 Women in business and entrepreneurship commanded the Red Bull Launch Institute stages at SXSW last week. During three days of lectures and workshops, the dominant themes were inescapable: there are challenges unique to women in the startup space, there are powerful support networks to help women in business succeed and there is tremendous female talent at the college level. Co-founders Penelope Gazin and Kate Dwyer of the online artist community Witchsy, spoke about their experience and strategy to overcome vendors and associates who would treat them less favorably than a male in their same position. Alongside Amanda Brinkman, creator of the “nasty woman” T-shirt, the trio used their couch panel on women-led startups to encourage college entrepreneurs to learn to work with people early in their careers, seek legal counsel during the business formation period and not to wait until you have a 100 percent ready product to launch. Several of the students attending Red Bull Launch Institute were approaching the launch stage for their products, like Dayana Hansley, a university studies-business senior at Texas A&M University and creator of the Motley Tool, the Swiss Army knife for first responders. Hansley displayed a prototype of her tool which she expects to have a first-year market potential of more than $2 million. Hansley worked with mentor and Red Bull Launch Institute alumnus Steven Dourmashkin, founder of Specdrums. Dourmashkin was one of five mentors brought together to coach the student participants during three days in Austin. The mentorship group included Austin, TX local Jane Hervey, founder of the #bossbabesATX monthly event series that amplifies self-identifying women in the creative industry and the arts. Hervey represented one of the many forces providing community and outreach for women. Red Bull Launch Institute gives wings to collegiate entrepreneurs and their ideas. During three days at South by Southwest Interactive Festival, six teams of college students will cultivate their innovative business concepts into reality under the mentorship of industry leaders and fellow entrepreneurs. At Red Bull Launch Institute, students learn during dynamic panel discussions, network and engage in individual team work with dedicated mentors to advance their business plans with the goal of achieving entrepreneurial success.